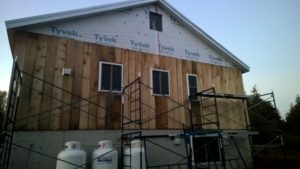 Another update for you all on the siding front. Today I got the first course of siding completed, on the last side of the house! We are so nearly there! I am hoping to get the upper course completed within the next week or so before it gets too cold for working outdoors, and will post pictures when it’s finally all complete! Another quick post just to update on our solar system. All is well on that front, though now that it is fall/nearly winter, I’m going to have to get out there and change the angle of the solar panels for their winter orientation. Thankfully, this is an easy job, and it helps collect the most solar energy possible due to the suns changing position in the winter sky. Still at it! Winter is coming (again)! 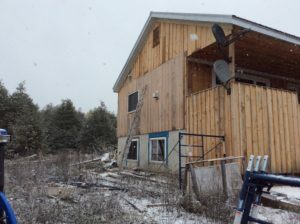 Just wanted to do a quick update on our recent progress with the house. You might have thought, “Those guys must be finished everything by now”, but you’d be wrong. We have only a couple things left to do to get our final occupancy certificate, and one of them that is just taking forever to get done is the siding. I finally completed the third (of four) walls, and have started on the last wall in hopes of getting it done before it is too cold to work outside. I also managed to get our radiant heat system connected, and it works really well. I still have to figure out some kind of thermostat system, it is very much manual, but we are exceptionally cozy in here so far as the temperatures are dropping off. 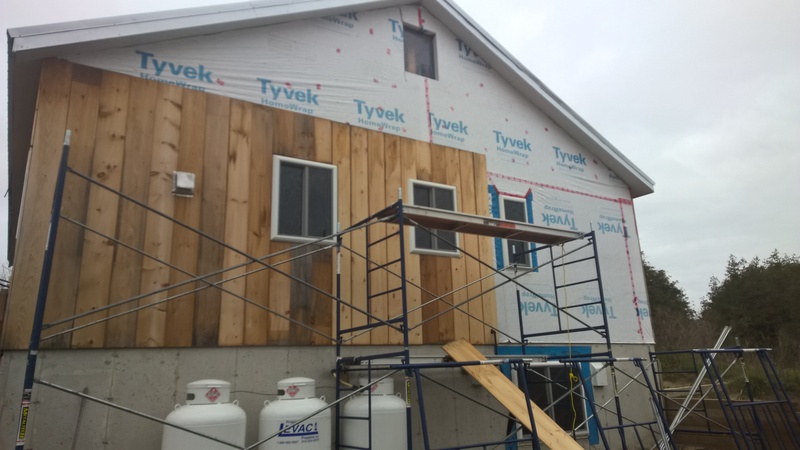 Hopefully I will be able to post again soon showing the final wall of siding completed, that will mean we will be just about ready to get our final occupancy!